Cool Your Body Down with the Best Outdoor Misting Fan. When the sun is beating down and the temperatures are topping out, an outdoor misting fan is a great accessory to have in any outdoor space. By combining a standard house fan with a garden hose attachment users can instantly cool down without getting too wet. In certain hot, dry environments, a misting fan is an absolute necessity for outdoor life! After looking at several different systems on the market today, we have rounded down our list to several excellent options. For an all-around great misting fan at a reasonable price, we recommend the NewAir AF-520B [Amazon Link]. It looks great, it feels, great, and the quality is top notch. The NewAir AF-520B is the best outdoor misting fan around! For a complete review of this fan, please see our Product Reviews section below. If you’re not in love with the tall free-standing design of the NewAir AF-520B, and want something a little bit more low-profile, you should certainly check out Lasko 7050 [Amazon Link] misting fan. While it is slightly more expensive than the NewAir, it does work really well and is so simple to use. It’s also small enough to move around easily, too, which is great if you tend to move from one patio area to another over the course of a day. For a complete review of the Laso 7050, see our Product Reviews section below. For those suffering through the heat, and looking for a budget solution, the Misty Mist [Amazon Link] fan misting kit is the way to go. As long as you have an existing fan that is suitable to combine with this kit, you’ll have your very own misting fan in a matter of minutes. It may not look quite as exciting as a purpose-built misting fan, but if it works just as well, who cares? The obvious downside to this is that if you have to buy a fan to pair with this system, the price will probably be as much or more than the other systems out there. For a complete review of the Misty Mist outdoor misting system, see below. 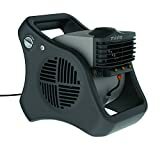 Updated Fan Misting Kit for a Cool Patio Breeze - Leak Blocker Added, Turns Heat Down by 20 Degrees, Easy On The Wallet, Portable, Connects to Any Outdoor Fan! In this section, we will examine five of our top picks among patio misting fans. We compare and contrast them, consider the advantages and disadvantages of each, and report our conclusions. You may also want to consider an outdoor ceiling fan, and if you aren’t sure you need the misting capabilities, be sure to check our Outdoor Pedestal Fan information as well! And if you’re on the go, consider a handheld misting fan for portable cooling. The NewAir AF-520B is our favorite outdoor misting fan, as it features a simple design, easy controls, effective cooling power, and a reasonable price point. The AF-520B has a short hose attached to it that connects to your garden hose. This hose has a small valve that can regulate the water flow through the hose. Misters that attach to the fan emit water into the fan. The fan then blows in the mist out in a 10-15′ area to cool those in the vicinity. 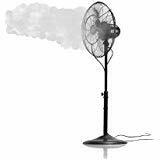 For a top quality oscillating misting fan at a top quality price, look no further than the NewAir AF- 520B. Although it does look beautiful with its bronze fan blades, don’t be fooled into thinking this fan is all about the looks. This misting fan also functions better than most others out there, providing just the right amount of mist needed on a hot summer’s day, and supplying a surprising amount of cooling power. It’s versatile and lightweight enough to be moved around and will look good in just about any setting. Designed to be kept outdoors, the NewAir misting fan is built with long-lasting, high-quality materials and has enough cooling power to cover up to 500 sq ft surrounding it. If it’s not oscillating, you could get up to a 20′ reduction in temperature; if it is oscillating, it will cool a larger area, but less significantly. This misting fan is very easy to assemble, and you should have no trouble putting it together in less than 15 minutes. And just in case you do have any trouble with any part of the product (not that we think you will), NewAir even offers a 1-year money back guarantee on these patio misters! This 18-inch oscillating misting fan on offer from NewAir is the bee’s knees. It’s lightweight and portable, meaning you can take it pretty much anywhere. NewAir has used very high-quality materials for these fans, and they are very functional. The spray is quite fine, so you don’t get too wet, unlike with some other models out there. There are also several built-in safety features that have been added to give you peace of mind, as water and electricity are always a concern when combined. Compared to other misting fans of the same caliber, the price is reasonable too. The NewAir AF-520B is our pick for best patio misting fan. And as an added bonus, this fan is available on Amazon Prime! The Lasko 7050 Misting Fan has a strongly different look than most of the other fans on our list today and is more reminiscent of a space heater than a powerful outdoor fan. Or perhaps a rejected Star Wars drone. See for yourself! This fan is ground-based, and and the angle of spray can be adjusted. Additionally, it oscillates left and right to spray over a wide area. However, be prepared to have your patio floor get rather wet if you put this on high power. The Lasko 7050 Misto Outdoor Misting Fan is easy to move around and doesn’t take up much space, so it’s ideal for those with small yards who want a low profile look. It’s made from quality materials that are weatherproof and rust resistant to keep it protected while outside. Lasko designed this misting fan with automatic louvers that provide a gentle sweeping of cooled air, and users can choose from 3 different speeds to suit your requirements. There’s no assembly required with this misting fan, which is always a plus! Simply plug it in and away you go. Of course, if you aren’t in the mood for mist, and just want to move the air around somewhat, this fan can be run without water. And to make cleaning easy, the misting kit is detachable, so it can be soaked in vinegar to clean up clogged misters. The Lasko 7050 ideal to be used at picnics, sporting events, sunbathing, and more, as long as you have a garden hose spigot and some 110v power nearby! The Lasko 7050 Misto misting fan is certainly a force to be reckoned with. You can tell that a lot of care has gone into the design of this fan and the quality of the materials can’t be knocked. In terms of price, it is one of the more expensive options out there, but you do get quite a few cool features included for your money. The automatic louvers are a nice touch, as is the water shut-off valve. However, the problems noted with this misting fan are that on high settings it sprays a lot more water than a light mist. This can get the patio very wet, and can also drench guests nearby. If you don’t mind getting wet that’s fine, but if you’re just looking for something to cool you down, this may not be for you. It’s also more expensive and noisier than the NewAir AF-520B. The Misty Mist fan misting kit is a great choice for those who already have a regular oscillating fan, but want to add a misting function. This kit attaches to any standard box fan, oscillating fan, etc., and enables the fan to spray mist and cool off the patio or deck space. These units are quite inexpensive and are a great choice for those on a budget, but of course, the pairing of two separate products, and getting them to be properly balanced for output, is a little more difficult with this unit than with a single-purpose water mister like the Lasko 7050 above. Need a way to cool down but don’t want to fork out for a whole new misting fan? Well, then this misting kit could be the answer you were looking for. The Misty Mist Fan Misting Kit gives you everything you need in one convenient little kit to keep you cool this summer. It’s a kit that hooks up to your existing fan and is a much more affordable way to keep cool on those scorching hot days. The quality of the materials are pretty good too and are backed by a 100% money back guarantee. In terms of functionality, it works just as you’d expect a misting fan should, though getting the balance right is a little more difficult than other products. The Misty Mist provides a nice, even spray that will keep you cool in even the hottest of temperatures. Included in the kit are 4 brass nozzles, 9 feet hose line, 10 tie knots, and a hose connector. It’s all pre-assembled, so simply attach it to your existing outdoor fan and away you go! If you’re looking for an affordable way to transform your existing fan into a mist maker to cool you down on those hot summer days, then look no further. The Misty Mist fan misting kit doesn’t take long to set up and is a much cheaper option than buying a new misting fan. The only thing to be aware of is that the hose connector may take a little adjusting to get right and may leak until you do. It’s not quite on par with the NewAir AF-520B Oscillating Outdoor Fan, but it is a more than adequate alternative if you’ve already got an outdoor fan it can attach to. Hence, why we’ve made it our budget choice. The Orbit 20066 Portable misting system is completely different than the other items on our list, in that instead of connecting to a fan, these units are attached to objects in the garden or patio, which emit mist down upon those underneath. The pergola spraying mist shown here illustrates the idea. You can purchase multiple flexible hose lines and tie them all together, creating a very effective misting system. There’s no need to shell out for an expensive misting system when you’ve got this kit available. Capable of lowering the outdoor temperature by up to 20′, the Orbit misting system is pretty compelling. Complete with 6 misters, 18 feet of tubing, 4 clips and a hose washer, this kit has everything you need to keep you cool this summer. And if you need more, you can easily add on more to the system! The design works similar to outdoor string lights and can be chained together. The design itself is pretty simple and the whole kit contains everything you need to install it, including 4 hanging snap clips that allow you to target where you cool. Installing the Orbit 20066 is simple and can easily be done in under 10 minutes. To keep your misting kit working as best it can, it’s advised to clean it annually using Orbit’s Mist Nozzle Cleaner. It’s also best to uninstall the kit before freezing temperatures hit to avoid any parts becoming damaged. Of course, these misters don’t spray long distances like the misting fans shown above do, but creating a mild mist from up above, over a large area, works really well at cooling the area down! Overall the Orbit 20066 portable outdoor mist cooling system is not bad. It’s inexpensive, easy to install, and will certainly keep you cool this summer. However, the quality is unfortunately reflected in the price and you may find yourself having to replace the system a few times due to clogging or rusting. So for those reasons you may be better off investing in the NewAir AF-520B misting fan. You may pay a little more for it up front, but it will last a lot longer. The Holmes water spray fan pairs a fan with a garden hose spigot in order to produce a powerful misting spray, with three settings, and quite a bit of utility. When turned onto high power, these will spray about 10-15′, and will cool the area they are spraying by approximately 10 degrees, though there’s a ton of variables that go into that estimate. It is a bit on the loud side if seated nearby though, which is a downside. Looking for a funky, modern, solution to cool yourself on all those hot, sunny afternoons? Then look no further than the Holmes Group HSF1614-BLU outdoor misting fan. With its motorized oscillation and drip-free design, this misting fan works wonders at keeping the temperature down. Assembly is very easy and can be done in no time at all, and all the parts seem pretty well made. You can adjust both the height of the pole and the tilt of the head to target wherever it is you want to reach, and it’s surprisingly moderately priced. When you first set up the fan, be sure to turn the adjustment on the front to engage the three misting sprayers. By default, only one is engaged, so you may find yourself disappointed upon first use! If you want something that looks great, feels pretty sturdy, and will keep you cool in even the hottest of temperatures, this may be the misting fan for you. In terms of price, the Holmes Group HSF1614-BLU misting fan is a cheaper option than the NewAir AF-520B, and its looks are hard to bear. However, in terms of functionality, it just doesn’t come close. The 3 selectable speeds certainly help to control the amount of mist that reaches you, and for a while, it probably works quite well. However, as soon as the nozzles start to become clogged (which isn’t very long) it stops spraying efficiently and no matter of cleaning seems to be able to fix it. Whatever your budget, whatever your taste, you can be sure there’s a misting fan kit out there for you somewhere. For us, there’s no contesting that the best misting fan around currently is the NewAir AF-520B. It’s not too expensive, it’s nice and small so is easy to move around, and it works just as you’d want a misting fan to work. In no time at all, you can transform your existing garden fan into a misting one!